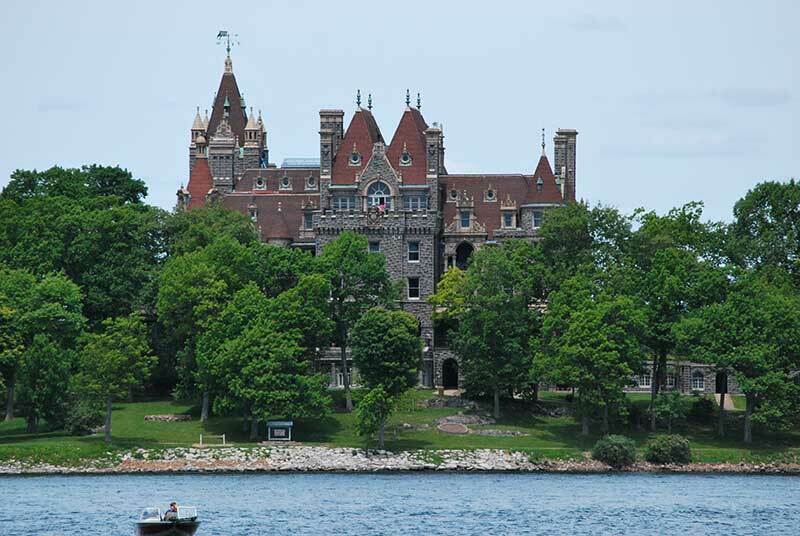 Located at the heart of the Thousand Island Region, Boldt Castle is the grandest of all Gilded Age mansions, and the setting of a tragic love story. Boldt Castle was built at the turn of the century by multi-millionaire George C. Boldt for his wife, Louise, as a testimony of the unsurpassed love of a man for his wife. Mr. Boldt came to America in the 1860’s from Prussia, the son of poor parents. A man of tremendous industry and organizational skill, with daring and imagination, he became the most successful hotel magnate in America. He owned the famous Waldorf Astoria Hotel in New York City, and the Bellevue-Stratford in Philadelphia, Pennsysvania. He was the president of several other companies, a trustee of Cornell University, and the director of the Hotel Association of New York. For Boldt, to “dream” and to “do” were synonymous. And Boldt Castle stands as an eternal monument not only of a man’s love for his wife, but also as a reminder that what a man’s mind can conceive, his heart can accomplish. George Boldt was one man whose dreams, however fantastic, proved to be within his capacity to achieve. Like an ancient landmark of northern Europe, the castle is modeled after buildings of the 16th century, when newly revived classical details were applied to the towered, medieval forms, combining traditional elements with modern features, such as large, plate glass windows and extensive verandas. Rising six stores from the foundation level of the indoor swimming pool to the highest tower room, an elevator served the 120 room mansion. Steel and concrete roofs and floors provided fireproof construction. Massive granite walls were richly ornamented with decorative details of cast terr cotta, and roofs were tiled with the same material. An underground passage led from the servants’ dock on the water’s edge. Goods transported from barges at the dock through this tunnel to storage rooms within the Castle’s foundation. The tunnel also housed water pipes and electrical wiring from the Power House. A rocky crest of the island was extended into a level plateau by making a promenade terrace on top of the stone-walled service tunnel. In contrast to the more natural landscape elsewhere on the island, this Italian Garden was to be geometrically formal, so high retaining walls were raised on the opposite side as well, making the plan symmetrical. At the opposite extremity of the garden from the Castle’s Ball Room, a fountained pool was surrounded by a curved, lower terrace, overlooking the picturesque roofscape of the Power House. Marble statuary intended for the Italian Garden, was delivered from Italy. Some of these statues were found half a century later still in crates, sunk within an old boathouse. 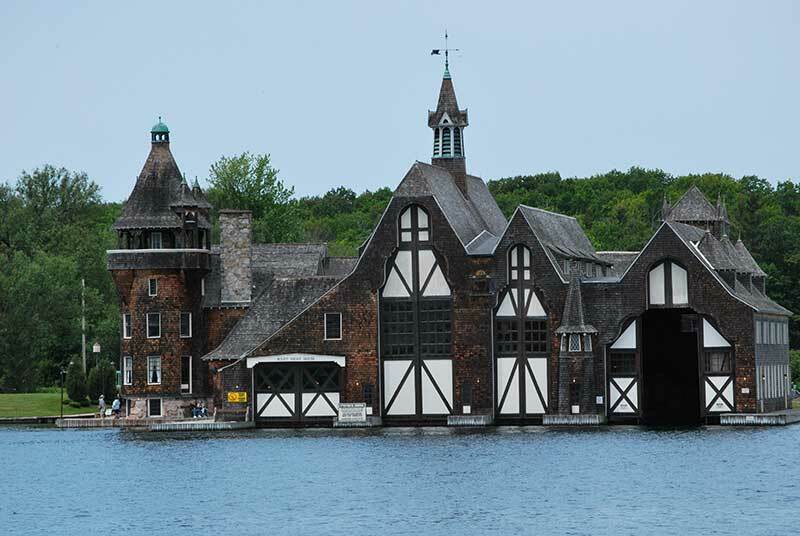 Boldt invested over $2.5 million to build this replica of a Rhineland castle, bringing in the finest of artists and the most skilled craftsmen for this project. He planned on presenting it to his wife on Valentine’s Day as a monument of his love for her. Work was underway on the eleven buildings that would comprise the castle complex when tragedy struck. In January of 1904 Louise Boldt died, ending the dreams of a lifetime. Heartbroken, Boldt telegrammed his construction crews ordering that all work be stopped. Three hundred workmen dropped their tools and left the island. Boldt never returned to the island, leaving it instead as an unfinished monument of a love story cut short.For 73 years the Castle and the other structures on the island were left to the mercy of the wind, rain, ice, snow, and vandals. When the Thousand Islands Bridge Authority acquired the property in 1977 it was decided that through the use of all net revenues from the Castle operation, it would be preserved for the enjoyment of future generations. Since then several million dollars have been applied to rehabilitating and restoring the Heart Island structures. The island is now fully accessible to the handicapped, has complete restroom facilities, picnic areas, as well as a food and beverage concession to make your visit more comfortable. Wander in awe as you explore the Castle’s 120 rooms, and try to imagine how they might have been luxuriously furnished and used in all their splendor, if Louise Boldt had not died so early. 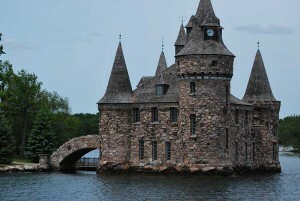 Gaze out the Castle’s 365 windows that overlook the magnificent beauty of the Thousand Islands. And imagine the gaiety and parties that might have been held in the castle and the surrounding gardens. The first level of the Castle has been turned into a museum, filled with exhibits dedicated to the lives of George and Louise Boldt and the development of the Thousand Island region. Stroll the paved walkways that traverse the island leading to the Castle, the Power House, Alster Tower, the Hennery, and the Gazebo. Examine the Power House and Clock Tower, designed after the fashion of a Medieval Tower, and located on the eastern end of Heart Island. This facility was intended to house coal fired steam generators to provide electricity to the island. An arched, stone bridge connects the Power House to the island, and the highest tower provided river traffic with illuminated clock faces and the music of chimes. Inside you’ll find displays and photographs depicting the lifestyle of a by-gone era in the Thousand Islands at the turn of the century. You’ll also find its steam engine generator, typical of the type that would have been used to provide power and illumination for the island estate. 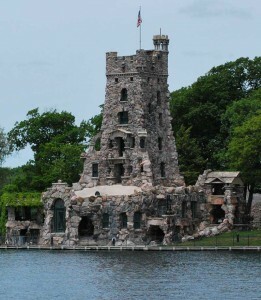 Alster Tower, the Boldt’s playhouse, was the first structure Boldt erected on Heart Island. Its design suggests a defense tower similar to those on the Alster River in Germany. But this curious mini-castle probably was not pre-designed, since it would have been nearly impossible to describe its eccentric and irregular forms on paper. It was likely improvised by Boldt himself in a highly personal manner, and evolving as it rose. This building was intended for the entertainment of guests and the Boldt children. The ornate “Shell Room” was to be used for dancing, and was so named because of the shape of the roof. The basement housed a bowling alley, and the upper floors were to include a billiard room, library, bedrooms, cafe, grill and kitchen. Unlike the main residence, which was never completed, this whimsical “play house” was completed and occupied by the Boldt family during the four years when the Castle was being erected. After extensive renovations to repair the deterioration of the edifice, Alster Tower is now open to visitors. The Arch, patterned after the Arch d’Triumph, was intended to provide a formal grand entry for launches that would deliver guests from large yachts anchored in deep water, or from other islands and the mainland. The arch was to be a welcoming point for guests, and symbolized Boldt’s triumph over poverty. Stones were cut and delivered for double rows of columns which would enclose a covered walkway, extending from each side of the arch. 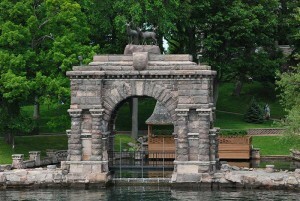 A drawbridge within the opening was to provide a promenade on the embankment of the Swan Pond. Unfortunately, this ambitious project was far from complete when work was ceased at the death of Louise Boldt. 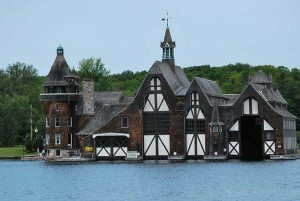 The Boldt Yacht House, located on nearby Wellesley Island can be seen from Heart Island’s north side, was built to house the family’s three yachts and houseboat. The main space rises 64 feet to accomodate tall masts and rigging of their yacht in slips 128 feet long, with doors so huge and heavy that an engine was required to open and close them. The yacht house included a shop to build racing launches as well as living quarters for the crew and maintenance staff. The Yacht House was opened to the public for the first time in the summer of 1996, after undergoing extensive repairs. It now serves as a museum where you can see some of the boats actually used by the Boldt family. Plan to spend your next vacation in the Thousand Islands Region and tour Boldt Castle in person. You will want to return again and again to witness the improvements as the repairs and reconstruction continue. 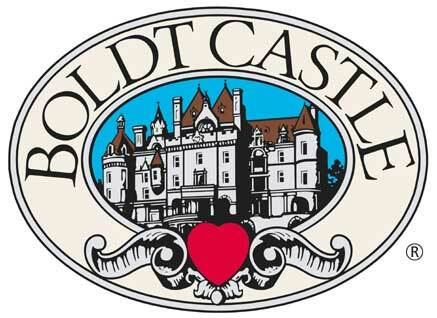 The island where Boldt Castle stands was named Heart Island by Mr. Boldt, perhaps because of the romantic significance of the name, and in recognition of the physical shape of the island after his modifications. Before then, however, the island was named Hart Island, after the previous owners. The original home which stood on the castle site when George Boldt purchased the island was slid across the ice to Wellesley Island during the winter of 1899, being made a part of the exclusive Thousand Island Club frequented by the very wealthy of the period. That home is now being renovated as a Bed & Breakfast, and has been renamed Hart House in honor of the original owners. I’m not so sure I like this Mr. Boldt guy. Talk about setting the bar a liltte high for the rest of us! Now my wife’s going to want her own island and castle. At least he did it right, as it’s just a beautiful place. Love the idea of the playhouse every castle should have a bowling alley.